Nobu Hanaoka was only eight months old when the US dropped ‘Fat Man’ — a Plutonium bomb — on the Japanese city of Nagasaki on August 9, 1945, killing about 74,000 people. 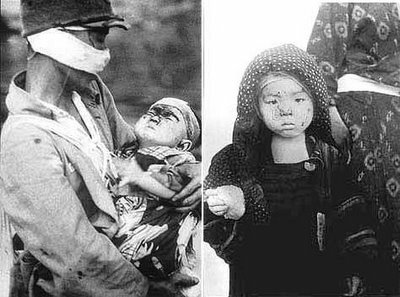 Three days before, ‘Little Boy’ — the first-ever atomic bomb, dropped on Hiroshima — had claimed 140,000 lives. Hanaoka has a message for the United States and North Korea as tensions escalate between the two countries over the possibility of a nuclear war. “And it shouldn’t be allowed on the surface of the Earth,” the survivor says with angst. “I want all nations to come together and start finding a way of eliminating nuclear weapons altogether,” pleads Hanaoka after warning that there will be millions of casualties if either the US or North Korea is attacked with radioactive weapons. It is sad that mankind does not learn from its deadly mistakes and is ready to unleash its devious power to wipe out fellow human beings. There is a kind of evil on this planet which the Chinese communist government has perfected, to inflict pain and torture on their innocent citizens which is not revealed to the people. The same kind of thing happened in Nazi Germany during the Second World War when millions of Jews were tortured and killed. What we are talking about today is the torture and killing of innocent men and women who are followers of a spiritual exercise and meditation practice called Falun Gong. Since the principles of truthfulness, compassion and tolerance do not go well with the government’s ideologies, people are forced to give up their faith and if they don’t, they are killed. And hold on, the shocking thing is their organs are extracted and put up in the black market for sale. Whereas, in the rest of the world you have to wait for an organ transplant, in China you can get it in less than a week. Can you imagine one human being inflicting so much pain on a fellow human being?